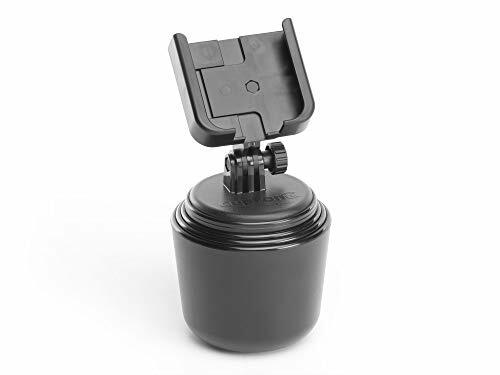 RoboCup is a patented portable caddy holder that securely holds two drinks, cups, rods, poles, tools, gear, drum sticks, phone, keys, GPS, personal belongings, glasses and perfect for fishing, boating, boat, golf cart, UTV, trade shows, musicians, drummers, microphone stand, guitar stand, mobility aid, crutches, wheelchair, walker, knee scooter, tractor, equipment cart, pool fencing, patio and more. 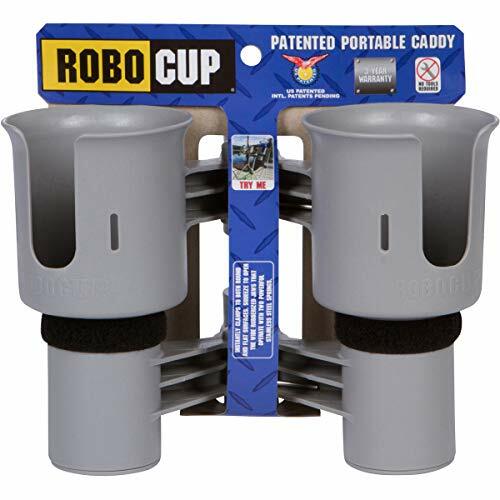 With no tools required, RoboCup clamps instantly to both round and flat surfaces up to nearly 2" in size. To open (1) hold the RoboCup with the jaws facing away from you and (2) using both hands squeeze the cups inwards using your chest muscles and (3) clamp onto a surface using both jaws equally. 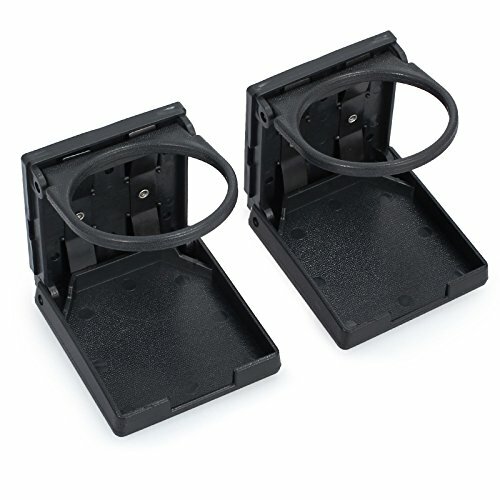 The dual rubberized jaws are designed to be leveraged apart from each other and for maximum security can be locked using a 4" plastic cable-tie. The bottom caps are removable for access to clean the RoboCup and for long objects including two fishing poles. The included two hook&loop straps with nylon buckle can be figured in various configurations for your needs. 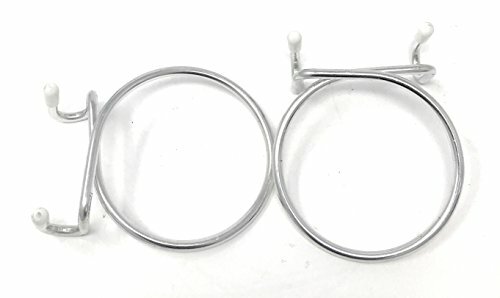 The springs and hardware are stainless steel for rust prevention and with a robust design, the poly resin material has UV-inhibitors added for longevity against the sun. Backed a five year warranty. Replacement Golf Cart Cup Holder for Portable Propane Heater Oversized Golf Cart UTV Cup Holder Insert, Fits 16.4 oz Heater Propane Cylinder Aftermarket replacement propane cup holder Allows you to use a 16.4 oz propane cylinder in your current cup holder Golf Cart Cup Holder for Portable Heaters Aftermarket replacement propane cup holder. Works with many brands of portable propane heaters.Replacement for golf cart heaters. 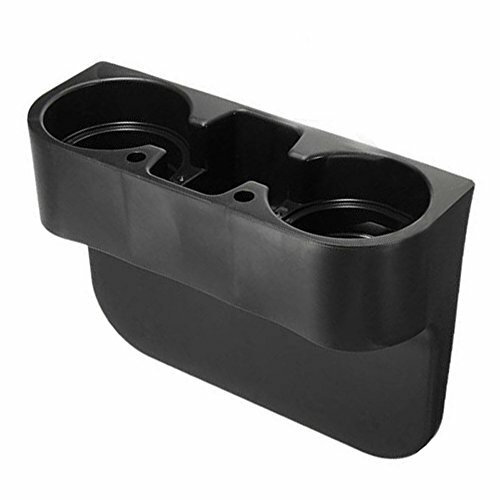 This cup holder is designed to hold the 16.4 oz propane tank used in many heaters Also great if you like to carry large drinks that don't fit in standard sized golf cart cup holders Made of molded plastic, tapered design Bulk order discounts are available, please contact us for pricing. MADE IN THE USA FREE SHIPPING TO USA WE HAVE ANY QUANTITY YOU NEED SO PLEASE LET US KNOW. Features: 100% Brand New, easy to install or remove Material: High quality ABS plastic. Long-distance drive good assistant No matter what little space but free and pleasant Good seismic performance, you do not need worry about spill when you are drinking For car design, it's better to maximize the performance of these products You can put it on the platform or clip the drink holder in the vent position A necessity for the thirsty traveler The car drink holder attaches to almost any frame and slides up and down the frame It is convenient for placing ashtrays, below 500 milliliter bottle of beverage or debris. 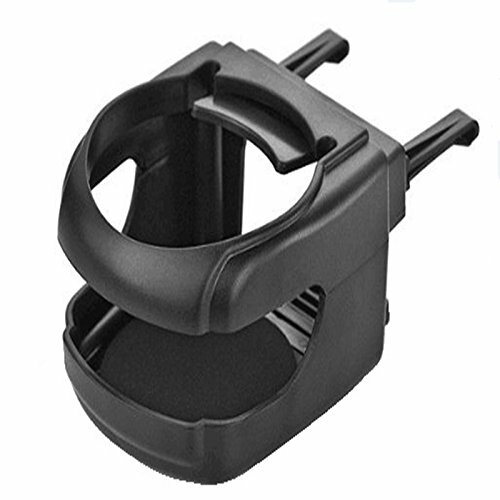 Item Subject: the base the movable inserting plate inserting plate tooth fixed the two wings bracket Package include:1 x Car Cup Holder Please note: Not recommend for 2012 Honda crv and older car air vents, we afraid that it doesn't work. 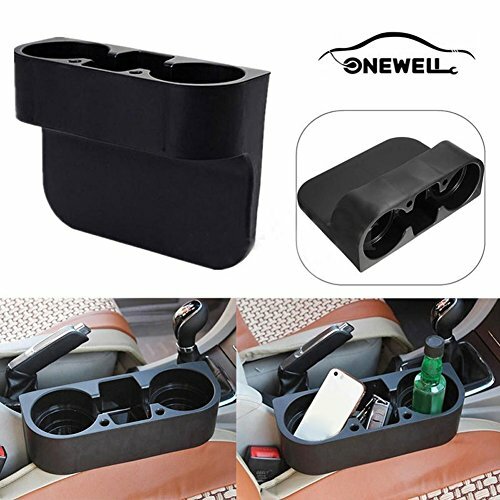 Before you purchase,welcome to contact us for this item whether fit for your car. Not recommend overweight of water bottle, we afraid that it will break the vent cover. Due to the movable inserting plate, it will slides up and down the frame. 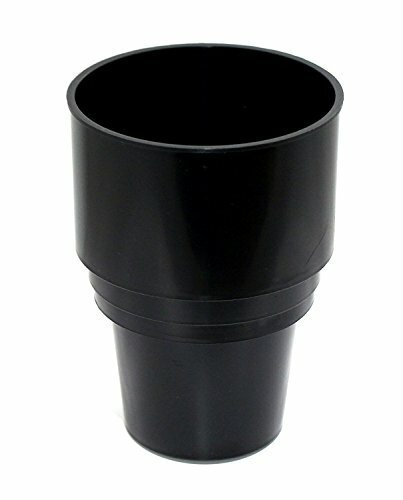 Want more Portable Cup Holders similar ideas? Try to explore these searches: 10 Lcd Screen, Slender Thread, and Handbag Decoration.